As revealed at ComicBook.com, Valiant is proud to announce the X-O MANOWAR #1 Brushed Metal Variant – an innovative, all-metal cover adorning the FIRST ISSUE of the EPIC NEW ONGOING SERIES from visionary creators Matt Kindt (Divinity, Ninjak, 4001 A.D.) and Tomas Giorello (Bloodshot Reborn)! Available to retailers who place qualifying orders on X-O MANOWAR #1, this ultra-limited edition of Valiant’s most important first issue of all time comes printed via a special process on an actual brushed aluminum metal sheet and features artwork by rising star Monika Palosz (Divinity III: Stalinverse)! Attention retailers: One copy of the X-O MANOWAR #1 Brushed Metal Variant Cover can be ordered by retailers who place a qualifying order of 500 copies or more. 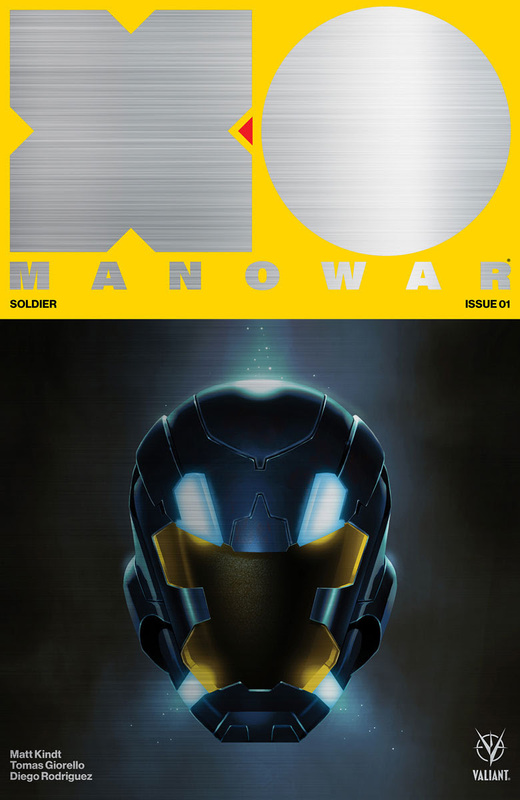 The X-O MANOWAR #1 Brushed Metal Variant Cover is strictly limited to one copy per qualifying store. For instructions on how to qualify for the X-O MANOWAR #1 Brushed Metal Variant Cover, please see the Diamond Retailer Site under order code: JAN172118. As recently unveiled at Entertainment Weekly, the all-new X-O MANOWAR #1 will be Valiant’s first landmark new series of 2017 and features New York Times best-selling writer Matt Kindt (Divinity, Ninjak, Mind MGMT) alongside an all-star arsenal of the most formidable visual storytellers in comics today – including Tomas Giorello (4001 A.D.: War Mother, Bloodshot Reborn), Doug Braithwaite (Armor Hunters, Bloodshot U.S.A.), Clayton Crain (Rai, Carnage), Ryan Bodenheim (The Dying & The Dead), and Mico Suayan (Bloodshot Reborn) – that together will span the series’ first year in 2017 and beyond!